Built in 1865, this Italianate-style home is one of the many fine residences that once overlooked the old public promenade, Scribner Park. The house was built for the Frank S. and George H. Devol families by their father, Horatio, who lived next door at 225. The home was always intended as a two-family residence, and 219 was occupied by Frank Devol. Frank and his brother were both involved in their father's business - the H.N. Devol Company - which supplied stocks of articles necessary for housekeepers, hotels, steamboats, tinners, country merchants and the public generally. George remained with the company until his retirement, while Frank became a bookkeeper for the City Gaslight and Coke Company, later becoming a director of the company. Both men also dabbled in politics: Frank was City Treasurer, while George was elected to the City Council and also served on the New Albany Board of Police Commissioners. Frank remained in his half of the house until his death in 1906. His son Robert, a druggist, had lived with his father since 1880 and continued to reside here until he passed away in 1948. Meanwhile, George Devol and his wife sold their half of the house in May of 1889. The John Newhouse family, who lived next door at 225, purchased 221 in March of 1894 and apparently used it for rental property. In 1948, Miss Stella Newhouse, John’s daughter, and her brother’s widow, Mrs. Josephine Newhouse, moved into 221 and remained there until their deaths; Miss Stella in the mid 1960s and Mrs. Josephine in the early 1980s. 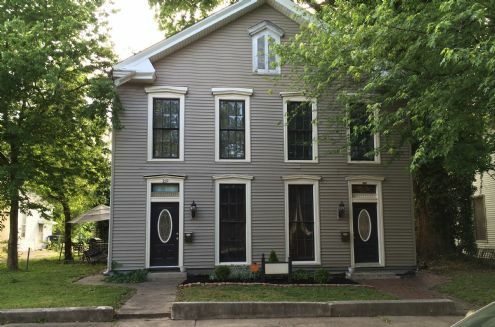 The 221 side of the house has a layout similar to 219's, with a parlor, dining room and updated kitchen on the first level, and two large bedrooms upstairs. Marble countertops, original ceiling medallions and fireplace mantels, and the Victorian-era side porch are just a few of the amenities in this half of the house. The large lot includes a rear parking area and mature trees, and is located just blocks from downtown New Albany. Renting for $680 per month. $800 deposit required.